It’s safe to say that HighDefCorals has taken the act of being a “Frag Swap Vendor” to a true art-form; they often have the swankest setup in the room. Gone are the days when vendors at frag swaps were simply hobbyists with a 20 gallon long and a metal halide light; these days frag swapping is serious business. Based in Oklahoma City, OK, Ed and Denise Brookshire, and partner Paul Whitby, dedicate their time to traveling the country to offer “[imported] livestock not found in your LFS.” For companies like HighDefCorals, perhaps we are better off thinking of their mobile setups as the gourmet food trucks of the aquarium industry. 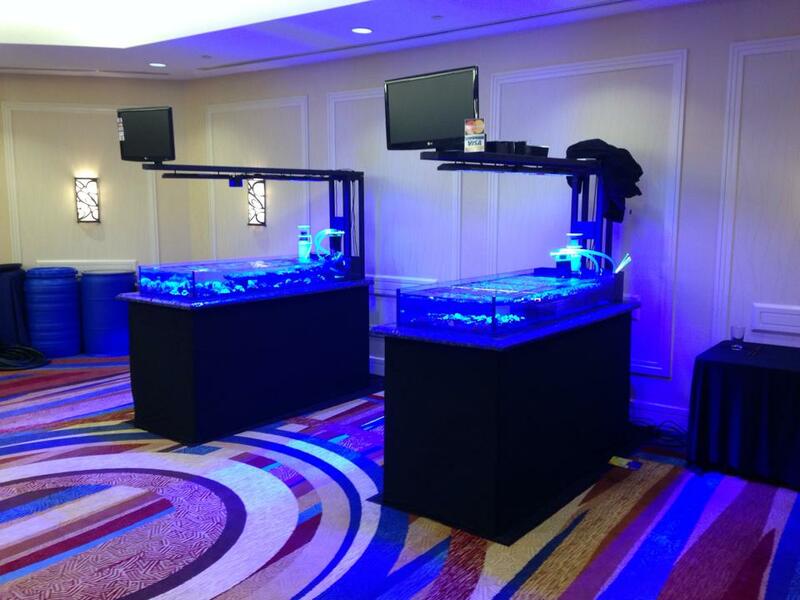 Last weekend at the inaugural Reef Currents conference and coral farmers market put on by MARSH, HighDefCorals took the time to film frag swap setup Friday night before the event on Saturday. What resulted is a 2-minute condensed look at the setup of the HighDefCorals display you see may see around your local frag swap or convention. They make it look easy, but having been there myself to see the tear down (and to get drenched when a hose came off a high volume water pump that was draining a bucket) there’s a lot to be done even with such a well-thought out and engineered setup. The twin frag tanks and all the powder-coated steel framework fit neatly into a 6′ X 12′ trailer for hauling around the country, while massive coolers and dozens (or hundreds) of tuperware style containers inside safely house corals for transport to and from the events. There are certainly a few contenders out there giving HighDefCorals a run for their money in terms of “awesome frag swap setup” – which mobile vendor has your favorite display?